From Students in Revolt to EDUCATION IN CHAOS! MYSTERY Book of all the books! If the Bible as a whole is the Book that NOBODY understands (except the very "elect"), certainly the REVELATION is the one Book IN the Bible least understood of all! Yet this Book is the very KEY to understanding of all the prophecies! CAN it, then, be understood? It can, if you have the key to this Book, itself. We give you, here, this KEY. This is not intended to be an exposition of the Revelation — merely a brief outline to give you the KEY which will unlock its true meaning for YOU. It's interesting — thrilling — vital. But to really grasp the fascinating TRUTH you'll have to STUDY this, carefully, reading every text quoted, as well as the entire Book, in your own Bible. WHAT'S GOING TO HAPPEN, FROM NOW? No man can foretell these events. But we can know what will happen provided we can UNDERSTAND the prophecies of the Bible! 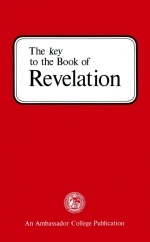 Understanding of the prophecies can come only if we have the KEYS to the Book of Revelation — for in it alone do we find events of the various prophecies correlated in order of time sequence. In the Book of Revelation is a STORY FLOW, relating one event to another in order of time sequence, with occasional insets injected into the continuous story-thread. This fact is the first KEY to understanding the Book. A REVEALING — Not a Concealing! Some believe Revelation is a closed Book, not to be understood. But the opening verse says: "The REVELATION of Jesus Christ ... TO SHOW unto His servants things which must shortly COME to pass." Not the hiding, concealing, or closing up — the REVEALING of Jesus Christ to SHOW events TO COME to pass. And in the last chapter it says: "Seal NOT the sayings of the prophecy" (Rev. 22:10). Notice (Rev. 1:1, 2), God gave the prophecy to Christ. Christ, not John, is the Revelator, who opens to our understanding the meaning of the prophecy. The first three verses contain the opening introduction; the remainder of the first chapter, the beautiful salutation. The dominant KEYNOTE of the Book — its subject, its theme — is revealed in the 10th, or middle verse of this chapter. This theme is "THE DAY OF THE LORD". In spirit, IN VISION, John was carried forward some 1900 years — projected, as it were, into THE LORD'S DAY, which is simply "THE DAY OF THE LORD" — the time of God's judgments and plagues upon sin at the end — where John sees, in symbols in this vision, these age-end events leading up to, and climaxing in, THE SECOND COMING OF CHRIST! Not understanding this keynote verse, endless controversy and confusion has resulted from arguing as to whether the message was revealed to John and written on a particular day of the week. But what misunderstanding! What waste of precious time! Such Greek scholars as A. Deissmann and F. J. A. Hort agree that the most logical meaning is "the Day of the Lord," the day of judgment. In spirit — IN VISION — John was projected 1900 years into the future, INTO the "DAY OF THE LORD, foretold in more than 30 places in prophecy, which is the Lord's Day, the time of His judgments and plagues soon now to come. The Concordant version, same as Rotherham's, translates it: "I came to be, in spirit, IN the Lord's Day." John, actually on the isle of Patmos, appeared to be, in vision, in the time of the "Day of the Lord," now soon to come. Just as Ezekiel (Ezek. 8:3) said, "The Spirit lifted me up between the earth and the heaven, and brought me in the visions of God to Jerusalem." And so the THEME of The Revelation is the events of the "DAY OF THE LORD," climaxing in the second coming of Christ. The second and third chapters contain the messages to the seven churches. These represent the church in its seven successive stages through the age, and also the seven characteristics to be found in the church all through the age — the Ephesian condition dominating at the beginning, the Laodicean condition at the end. You should study, and apply to yourself, these messages. The SETTING for the main revelation of future events is found in the fourth and fifth chapters. Here, in vision, John is taken into heaven where events TO OCCUR ON EARTH are revealed. He sees God the Father sitting on His throne, the Book of this prophecy in His right hand, sealed with SEVEN SEALS — thus completely closed to understanding. Seven denotes completeness. And fix in mind, THE SEVEN SEALS COVER THE ENTIRE BOOK. In his vision, John sees Christ take the Book from the right hand of the Father and, one by one, in this heavenly setting, open the seals — showing us, His servants, things shortly TO COME to pass — not events AFTER they have occurred, but showing events TO COME to pass-BEFORE they occur! Just as Jesus spoke, during His earthly ministry, IN PARABLES to those "without" — thus veiling the true meaning so they would not understand, yet explaining, in plain language, the meaning of the parables to His own surrendered followers (Mark 4:10-12; Matt. 13:10-15), so here the prophecy is IN SYMBOL, which those "without" cannot understand — but which Jesus will explain in PLAIN LANGUAGE to His true followers who keep His Father's Commandments (Ps. 111:10), and possess the Holy Spirit (John 16:13; Acts 5:32). Because of rebellion against God and His Commandments, it is not given to all to understand (see Dan. 12:10). Those who break and teach against the Commandments cannot understand Revelation. But just as Jesus explained the meaning of His symbolic parables to His true followers IN PLAIN LANGUAGE, so He who is the SAME yesterday, today and forever (Heb. 13:8) explains these symbols. Did Jesus, then, in PLAIN Language explain these same events of the end-time, leading up to His second coming and age-end? He did! When His disciples, on Mount Olivet, asked Him, "Tell us, when shall these things be? and what shall be the SIGN of thy coming, and of the end of the age?" (Matt. 24:3.) Jesus gave a startling prophecy, explaining in plain language these events which shall end the age. In His Olivet prophecy (Matt. 24), Jesus listed these six events to occur: 1st, false prophets or false Christs (verse 5); 2nd, wars (verse 6) throughout the age, culminating at the end-time in WORLD WAR (verse 7); 3rd, famines; 4th, pestilences (verse 7). Then Jesus digressed (compare Luke 21:12) to go back and describe the siege and destruction of Jerusalem in 70 A.D., because this was a type and forerunner of the coming age-end siege against Jerusalem and time of ARMAGEDDON (compare Luke 17:30-36 with Matt. 24:17-28). Thus Matthew 24:9-28 and Luke 21:12-24 apply to the period of 70 A.D., only as a type or forerunner of this age-end time, to which, therefore, it literally refers. Then Jesus shows, 5th, THE GREAT TRIBULATION (Matt. 24:21, 22), followed, 6th, by THE HEAVENLY SIGNS of the darkened sun and moon with the stars falling (verse 29), together with the SIGN of Christ's coming, seen in heaven (verse 30); and this was later followed by the actual COMING of Christ (verse 30). Notice how accurately this explains the symbols of the six seals of Revelation 6: When the FIRST SEAL is opened (Rev. 6:1), John sees a white horse (verse 2) — an imitation of Jesus at His second coming described later in Revelation 19:11-16. Here are pictured FALSE CHRISTS — preachers deceiving and causing multitudes to accept them as the ministers of righteousness (II Cor. 11:13-15), preaching counterfeit Christs (II Cor. 11:4) represented to be the true Christ who died for us on the stake. The world is full of them, though deceived multitudes do not realize it! The second seal is opened (verses 3 and 4) and a red horse appears, killing men, taking peace from the earth symbolizing WAR. The fifth seal (verses 9-11) depicts one phase of THE GREAT TRIBULATION — the martyrdom of saints. This shows the Tribulation occurred in the Middle Ages only as a type, or forerunner, for the martyrs of that time are told to wait until this end-time martyrdom. The sixth seal shows the heavenly signs — sun and moon becoming dark, and the stars falling (verses 12-13). Some claim this already has occurred, but the events they describe were mere LOCAL events, seen only in a small section of New England, and merely a forerunner and warning of the far more vast, awe-inspiring, terrible event here described as YET to come. It occurs AFTER the Tribulation (see also Matt. 24:29). Furthermore, this event is accompanied or immediately followed by the SIGN of the coming of Christ (Matt. 24:29-30) — which Revelation 6:14-17 shows is the heavens departing as a scroll rolled together — men hiding themselves in stark terror in the dens and mountains, crying for the rocks and mountains to fall on them and hide them from the face of Him who is sitting on the throne in heaven (compare Rev. 4:2, the scene where John, in vision, sees these seals being opened) — and from THE WRATH OF THE LORD, for THE GREAT DAY OF HIS WRATH IS COME! This (compare Zeph. 1:14-17) is "THE DAY OF THE LORD." 7 Third Woe or The Seven Last Plagues. It is vital to understand the distinction between the Great Tribulation and the Day of the Lord. The heavenly signs do not occur until AFTER the Tribulation (Matt. 24:29). But they are to come BEFORE the "Day of the Lord" (Joel 2:31). The two are different and separate. 1st, Tribulation; 2nd, heavenly signs; 3rd, Day of the Lord, which, we shall see, is the seventh seal. But just as we come to the time for the terrible DAY OF THE LORD to strike, an angel appears holding back the four winds (Rev. 7:1-3), which are the first four Trumpet plagues (Rev. 8:7-12) of the Day of the Lord. The 144,000 are 12,000 from each of the literal tribes of Israel. They are sealed by the Holy Spirit, IN their foreheads, and it is THE FATHER'S NAME that is sealed there (Rev. 14:1). The TIME of this sealing, then, is yet future — after the Tribulation, after the heavenly signs, after the SIGN of Christ's coming appears in heaven. The innumerable multitude shall have come out of THE Great Tribulation (Rev. 7:14, see margin). God will not send His plagues without warning of such supernatural nature (the heavenly signs and the sign of the Son of Man) that all who are willing shall heed. Preaching and warnings now seem to fall on deaf ears. But when God sends these mighty supernatural signs, MEN WILL HEED and turn to Christ. Then comes the opening of THE SEVENTH SEAL, in the 8th chapter. And what IS the seventh seal? Remember, the seven seals covered the ENTIRE BOOK, so this seal covers the remainder of the prophecy. Under each seal John records what he SEES. What does he SEE, as this last seal is opened? (Rev. 8:1-2.) He sees THE SEVEN TRUMPETS being handed to the seven angels. The seventh seal comes in SEVEN STAGES, each called a Trumpet. These are PLAGUES (Rev. 9:20). A trumpet is BLOWN. The first four Trumpet plagues are described as winds that BLOW on the earth, trees, rivers, sea (Rev. 8:112). I do not, here, attempt to interpret the nature of these plagues — whether this language is to be taken literally or as symbols. But remember, if you attempt to interpret these things as symbols, you must find a BIBLE interpretation for each. A Trumpet also is a symbol of WAR, and the 5th and 6th Trumpets picture WAR — the two phases of the coming WORLD WAR III. The last three Trumpets, the 5th, 6th, and 7th, are called WOES (Rev.8:13). The first woe, or 5th Trumpet, is described in chapter 9, verses 1-11. The power that causes the destruction, this time to men, comes out of the "bottomless pit." We know this is a symbol. The only place in Scripture where it is interpreted is Revelation 17:8-14. There we learn that the rebirth of the old ROMAN EMPIRE is the power that emerges out of "the bottomless pit." It is a war-making power (verse 14). Mussolini restored the pitifully weak, insignificant SIXTH "head" of the "Beast" — the Roman Empire. A seventh and last revival is yet to come. The second woe, with its symbols of horses and horsemen (compare Ezek. 38:4, 15 and Joel 2:4), is described in verses 13-21, chapter 9. Could this be the USSR destroying the coming United States of Europe called "The Beast" and "Babylon" in Revelation, chapters 17-18; also described in Isaiah, chapters 47-48 and 13-14, and in Jeremiah, chapters 50 and 51? And now notice that the TWO WITNESSES end their mission (chapter 11) at the END of the second woe (verses 12-14). They are killed by the "Beast" — reborn Roman Empire that comes out of the bottomless pit under the first woe — which places the time YET IN THE FUTURE, shattering some cherished man-made theories. Now comes the THIRD WOE, or 7th Trumpet. What is it? This is the 7th and last part of the seventh seal, and remember the seven seals cover the ENTIRE PROPHECY! Notice Revelation 11:15-18. When the 7th Trumpet sounds, the nations are angry — in world war, again raging — and it is proclaimed, "THY WRATH is come." The only thing here described that possibly could be this terrible woe is "Thy WRATH." And what is "THY WRATHS"? According to Revelation 15:1, it is THE SEVEN LAST PLAGUES! Just as the seventh seal is subdivided into the SEVEN TRUMPETS, so the 7th Trumpet is divided into the SEVEN LAST Plagues, which are and constitute the 7th Trumpet or third woe. Thus the seven last plagues, too, are a part of the seventh seal. The second coming of Christ shall occur at the precise time of the seven last plagues. And so, as this 7th Trumpet is blown, the kingdoms of this world are become the kingdoms of Christ, who then reigns (Rev. 11:15). So Christ comes at the LAST TRUMP (I Cor. 15:52; I Thes. 4:16). Chapter 12 is an inset chapter, injected into the main story-thread. Just as any writer will stop his narrative at a certain point, go back and sketch a different scene involving different characters and events, bringing them up to, and connecting them with his story-thread at that juncture, so here John pictures the TRUE CHURCH, from the time prior to Christ's birth (verse 4), through His birth, resurrection and ascension (verse 5), and the 1260 years of persecution when the TRUE CHURCH was forced to flee completely beyond the bounds of ROMAN dominion. The TRUE CHURCH has always existed. The church of chapter 17 is the great false church. Revelation 12 brings the story of the true church to the present, when the devil, knowing he has but a short time (verse 12), persecutes the true Church, pictured as a remnant or SMALL in number, and KEEPING THE COMMANDMENTS OF GOD (verse 17), while the false church and her daughters (Rev. 17:5) preach the Commandments are done away! The 13th chapter is another inset, picturing the symbolic "beast" and the second two-horned "beast." Chapter 14 shows the three angel messages, proclaiming the fall, or DOOM, of "Babylon" through the seven last plagues, and the warning against the MARK OF THE BEAST, which those in "Babylon" are deceived into having. Chapters 15 and 16 describe THE SEVEN LAST PLAGUES, which are the third woe or 7th Trumpet. These are God's judgments against this false religious system, "Babylon" (Rev. 18:2, 8, 10). Chapters 17 and 18 picture the revived Roman Empire and the great FALSE CHURCH, with her DAUGHTER CHURCHES (chapter 17:5) deceiving all nations (chapter 17:1,2 and 18:3). Israel is today IN BABYLON — deceived! (Jer. 50:48,13-15; 51:6-9; Isa. 47:1, 5, 7-9, 11; 48:1, 12, 17-20.) We are God's people, Israel — IN BABYLON today, as Israel was in Egypt when God's plagues were on Egypt! And God calls US OUT (Rev. 18:4) and tells us to keep His commandments! NOTE: To understand this booklet, be sure to read every text quoted IN YOUR OWN BIBLE.